Valkokankaalta tuttu elokuvafilmi nyt käyttäjäystävällisessä paketissa. C-41 kehitys. Tungsten valkotasapaino. Päivänvalossa kuvattaessa käytettävä 85B-suodinta haluttujen tulosten saamiseksi. The second generation of CineStill film is now being produced! 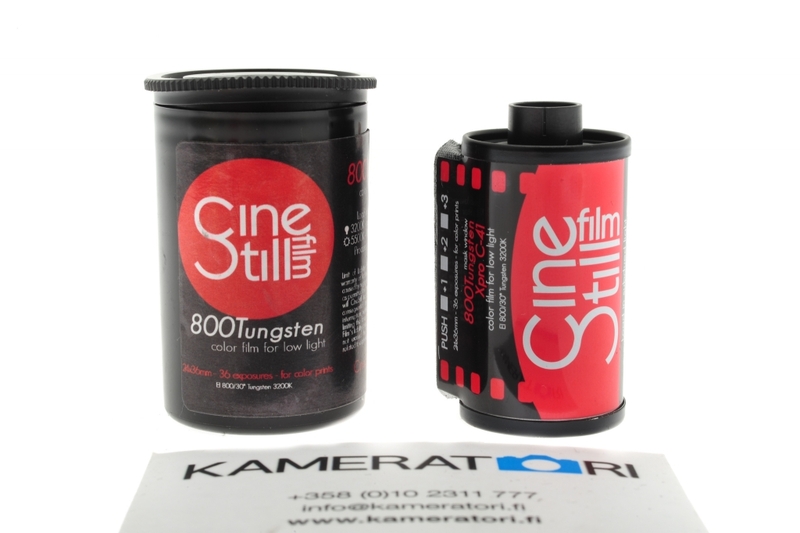 With an improved and refined process, 800Tungsten is producing superb result in standard C-41 chemistry! Great rated ISO 200-2000! Can be pushed to 3000! Original fresh stock from Kodak Vision3 500T 5219 prepped and rolled for clean safe C-41 standard development as an ISO 800 film. May also still be processed in motion picture ECN-2 chemistry. Our very custom "Premoval" (patent-pending) process makes motion picture ( ECN2 / ECN-2 ) film safe to process in standard C-41 photo lab chemicals or at home. Note: This film was designed to be processed in ECN-2 Chemicals and may still be processed in it's native chemistry. Test results show consistent in standard C-41 machine processing when compared with ECN-2 motion picture lab processing performed by professional labs. Long term archival stability has not been tested past 3 years. Expectations for archival longevity should be somewhere between Kodachrome and most C-41 films but there are no guarantees.